Squeezed a few drops of dye reinkers onto pieces of watercolor paper and then spritzed some water -- more on the paper on the right. Dabbed a piece of paper towel on the paper on the left. 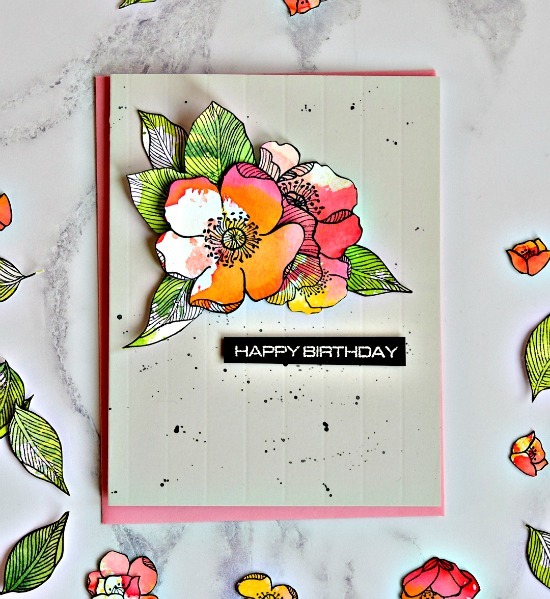 Stamped flowers from Altenew's Adore You, making sure to leave white on the flowers. Repeated for the leaves. Love this variation of colors. Removed the back layer of the watercolor paper so it was nice and thin and trimmed out the flowers and leaves. Assembled onto a soft gray card that I had speckled with black paint. Look closely at the top photo and you might see that the card is scored every half inch. Was inspired by Altenew's current inspiration challenge. And one more look at my card.... This will be hard to mail so it will be hand delivered to a friend. MOOD WHEN DONE = Happy. I have plenty of flowers and leaves for more cards. This is really pretty! I love the colors! 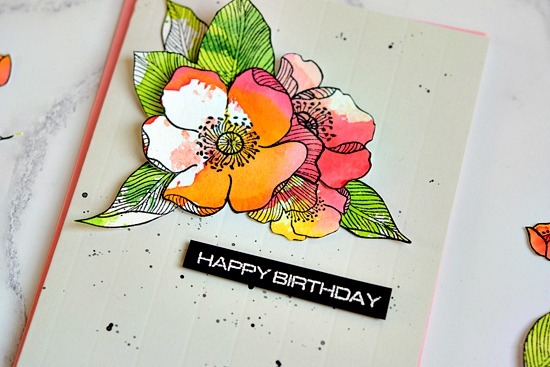 you should be happy with that card - love how you did the watercoloring - that stamp set is on my wishlist! Love those intense colors - really beautiful! I love what you did with the flowers! Looking at the paper I wouldn't have thought they'd come out so cool, but once they're cut out and arranged, it's amazing the effect. I just bought my first Altenew stamps, but who knows when I'll get around to using them. This is certainly inspiring. This is absolutely stunning, love it!! Sooo pretty Joan. You could send this to me for my birthday!! :D lol..
Joan, this card is amazing--I do love it, and I want to try your technique now! IN LOVE!!! with this card! Gorgeous neutral backdrop and love the ink splatter too :D Thanks for joining in with the Altenew Inspiration Challenge. 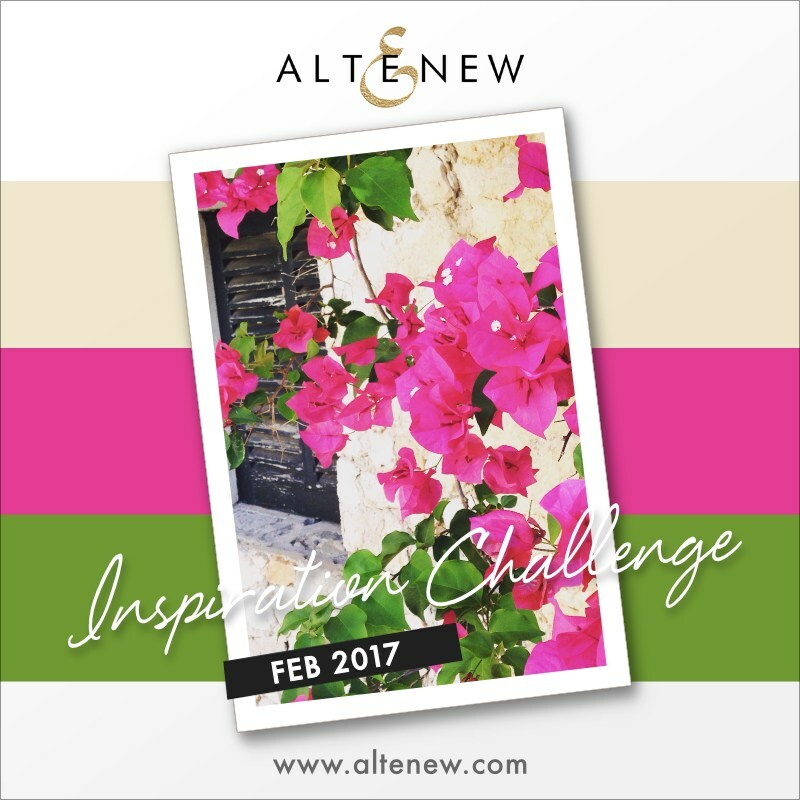 Just saw the Altenew post choosing your beautiful card as a Feb. challenge winner. Congratulations! I can see why it would be a winner! Gorgeous!! What a fantastic card...love your technique!!! Wow! This just takes away "stampers block"! No fuss!! Thank you! Absolutely Stunning flowers and leaves, Joan. 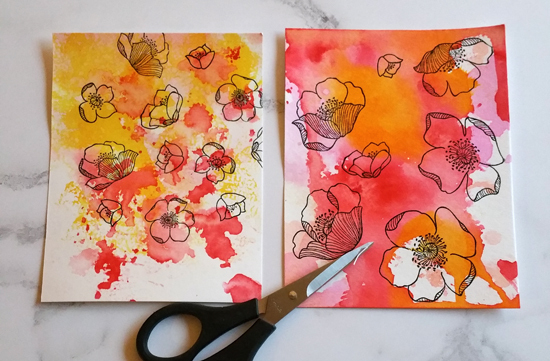 I love how you watercolored your backgrounds leaving white spaces and then stamped and fussy cut your flowers and leaves. Your CAS design is so creative and beautiful. TFS Hugs.. This is one of my favorite Altenew stamp sets and ecstatic they just came out with the dies. 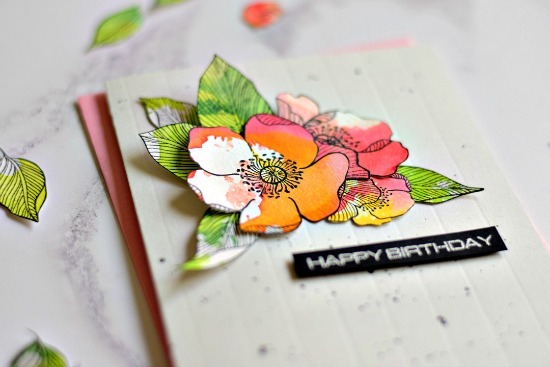 Cannot believe how simple your process was for such a stunning card! The techniques and the design of your card are just fabulous. Love it!The colours are stunning. Thanks for sharing your technique tips as well! The flowers are gorgeous. Love the way you colored them.